Steve “Wish” Shannon is a Vermont native hailing from the rural North East Kingdom. He began dancing in his basement with his older brother as a teenager, copying moves he saw from Michael Jackson and the movie “Beat Street”. In high school he began taking theater and dance classes, in Vermont and beyond, and began training/performing with professional b-boys. After briefly studying theater and dance at Johnson State College, teaching at several Burlington area studios, and busking on the Church Street Market Place with his crew, the Rhythm Riderz, Wish moved to Orlando Florida at nineteen years old. Accepting an invitation to perform full time at Universal Studios, he began his professional dance career. Moving on to the Orlando Magic, Disney World, Sea World, Busch Gardens, and the NBA finals, he then left Florida to spend five years traveling aboard Carnival Cruise Lines with other B-Boys as a specialty act. Before moving back to the green mountain state, he would spend six months touring North America with the World Famous Harlem Globe Trotters. During all these travels, Wish consistently returned to Vermont to teach and share what he was learning. He has been a returning guest-artist at both Lyndon Institute and Lamoille Union High School every year since 2007. 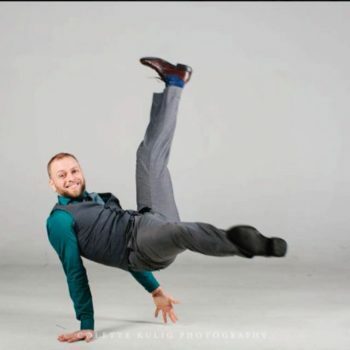 Now residing in Burlington, he is proud to be teaching classes for all ages at Swan Dojo dance studio as well as battling and performing with the Rhythm Riderz Crew. He believes Hip Hop (dance, music, art, culture) is often misrepresented in the media. “Wish” wants to bring light as well as accessibility to the more authentic and positive side of the Hip Hop lifestyle.